The Dodgers’ approach is shameful. Let boys be boys. Celebration is fine. Celebration is disrespectful. Yasiel Puig is precisely what a stodgy game needs—unless he should instead grow up and shape up. There is little question that the game’s acceptance of on-field merriment has grown more lenient. The celebratory scrum that is now de facto after walk-off wins was, only recently, limited to games in which a team clinched a playoff series. 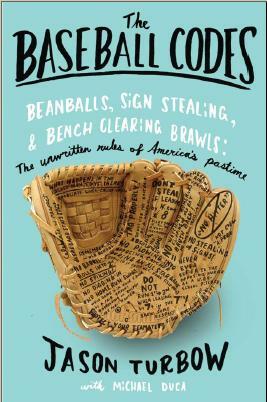 Hand gestures that have become common— Texas’ antlers, Milwaukee’s beast mode, Hanley Ramirez’ goggles—that once they inspired discussions about propriety now barely make a ripple. 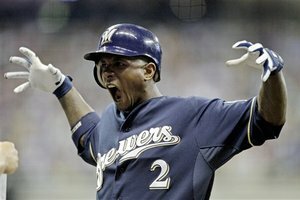 Once these things become integrated into baseball culture, after all, they become just another means of celebration. And when something becomes institutionalized, it becomes a whole lot harder for the opposition to take it personally. That said, these Dodgers seem hell bent on pushing the boundaries. Racing across the diamond at Chase Field to frolic in the pool upon clinching the National League West. Going so far, according to reports, to treat it like a urinal. 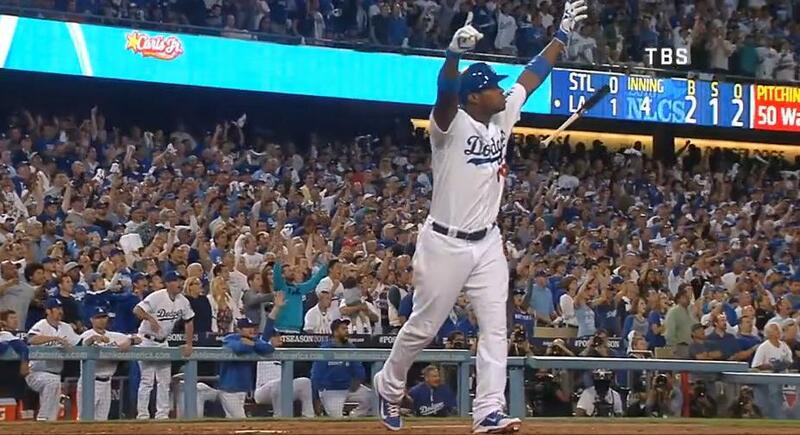 Puig’s arms-raised celebratory home run pimp on a ball that didn’t leave the park in Game 3 was all the more amusing because he still ended up with a stand-up triple. Whereupon he did an arms-raised celebratory triple pimp. Adam Wainright said that in Game 3 of the NLCS, Adrian Gonzalez was heckling him from third base as he tried to pitch. He called it “Mickey Mouse stuff.” Gonzalez at first denied it, then offered the most Dodger response possible, making Mickey Mouse ears when returning to the dugout after a Game 5 home run. Ultimately, it comes to this: Baseball changes very slowly, but it does change. 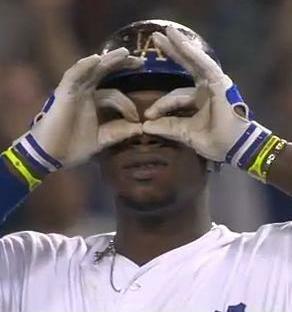 Puig is the youngest, freshest face that the sport has, and he does not have to be universally loved to affect change. Few transformative figures do. The idea of the Code—an enforced system of respect, displayed through proscribed on-field behavior—becomes more difficult to maintain every year, as old-school adherents retire and are replaced by those who never cared much for it in the first place. Enter the attention given somebody like Puig—who does not disdain the Code so much as revel in the fact that he never learned it in the first place—and we’re looking at a sea change. Celebrations—be they directed at seasons, games or individual feats—are now commonplace. Puig may represent the crass end of that spectrum, but he is on the spectrum nonetheless, and is pushing the window of what is acceptable toward a place that makes purists howl. Then again, howling is what purists tend to do when their reality changes from beneath them. The Dodgers running roughshod as a team over the Arizona ballpark was simply a bad idea, but it shouldn’t distract from the rest of this conversation. Love it or hate it, the game’s unwritten rules have taken a body blow this month. Get used to it: We’re looking at less of an outlier and more of the norm. The dodgers may be going outside the code but the Cardinals aren’t the keepers of the code either, although they act like it. Don’t like something the other team does? Take action to correct it, but shut up. Isn’t that really what the code is? What I DON’T want to see is what has happened in the NFL. Ridiculous celebrations after damn near every play. Cartwheels, dances and all that BS. A little bit of exuberance goes a long way. As someone once said, “Act like you’ve been there and that”.